Mrs. Helena Kaushik Women's College strives to prepare young women in India to acheive excellence in all their endeavors. We hope them to be visionary and effective leaders in their chosen professions and vocations in the service of their communities, India and the world. Our aim is to pursue Excellence, Truth, Service, and Virtue. Mrs Helena Kaushik Womens College, Jhunjhunu offers various graduate courses as well as Post Graduate courses. 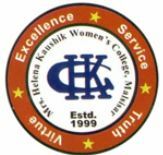 Mrs Helena Kaushik Womens College, Jhunjhunu is affiliated to University of Rajasthan, Jaipur. List of facilities available at Mrs Helena Kaushik Womens College, Jhunjhunu for students.